afrol News, 11 February - The government of Seychelles has signed first-ever deals with justice ministers from Somalia, Somaliland and Puntland for the repatriation of convicted pirates, to serve their prison sentences at home. Seychellois Minister for Home Affairs, Joel Morgan, has signed "agreements relating to the return of Somali prisoners to their homes to serve the remainder their prison sentences" at the Victoria Ministry of Foreign Affairs this week, the Ministry said in a statement to afrol News. The signing was the result of talks held in Seychelles over three days with Somali representatives from Puntland, Somaliland and the Transitional Federal Government (TFG), in collaboration with the UN Office on Drugs and Crime (UNODC) and facilitated by Danish Ambassador Thomas Winkler. 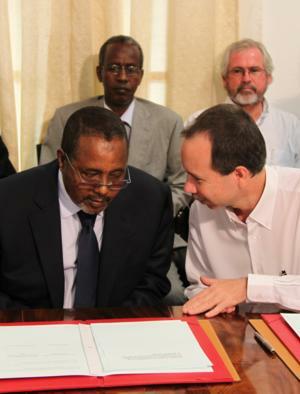 The three agreements include a Prisoner Transfer Agreement with Somalia's transitional Minister for Justice, Abdullahi Abyan Nuur. This is the first agreements of this character worldwide to be signed with Somalia's TGF, and could become a model for other countries involved in the clampdown of piracy outside Somalia and East Africa. Also the Justice Ministers of the non-recognised Somali states Puntland and Somaliland, Absi Khalkif Hassan and Ismail Mumin Aar, signed two Memorandums of Understanding with the government of Seychelles. The two ministers were "declaring their intent to establish Prisoner Transfer Agreements following consultations with their respective governments," according to the Seychelles government. The ministers of Somaliland and Puntland said they were "hopeful that the final agreement will be signed at the next meeting" of an international working group on Legal Issues for the Contact Group on Piracy, due to take place in Copenhagen in March this year. "This is a very important milestone and a great achievement in our efforts to combat piracy. It is the first such agreement signed with any state which allows for the repatriation of convicted Somali pirates back to their country where they can be close to their families and be imprisoned for the remainder of their sentences," said Minister Morgan. "The government of Seychelles is fully committed to supporting the state of Somalia and the restoration of law, order and peace... this agreement shows our full commitment to combating piracy," added the Seychellois Minister. Minister Morgan went on to emphasise that the problem of piracy and of Somalia is a problem "not only for the region," but also for the whole international community. For Seychelles, the expansion of piracy into its national waters has cost millions in lost revenues from fishing and tourism, and in extra transport costs due to insurance for cargo bound for Seychelles. During the talks held in the Seychellois capital, the three Somali delegations also took the opportunity to visit the Somali prisoners currently incarcerated at the Montagne Posee prison. The Seychellois coastguard on several occasions has been able to capture Somali pirates or suspected pirates in dramatic operations to liberate vessels seized in its waters. A number of convicted pirates from different parts of Somalia therefore now are imprisoned in Seychelles. Other groups of suspected pirates, caught in Seychellois waters, however have been allowed to return to Somalia without prosecution. Only in December, a group of suspected Somali pirates was repatriated from Seychelles to Somalia as there was insufficient evidence to prosecute.